Within the framework of the BBC’s generous coverage of the Hamas-Fatah unity deal, BBC television news programmes aired an interview with one of the Palestinian officials who has been doing the media rounds – Hanan Ashrawi. 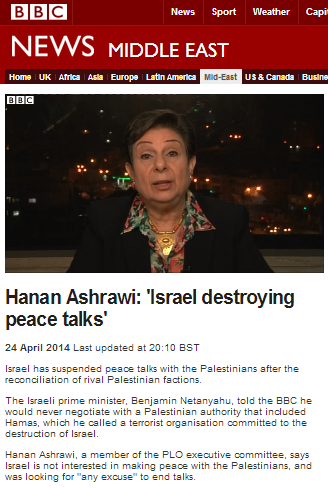 The interview, conducted by Zeinab Badawi, was also posted on the BBC News website on April 24th under the unambiguous title “Hanan Ashrawi: ‘Israel destroying peace talks’“. The interview was also promoted on Twitter using similar language. Hamas is of course recognized as a terrorist organization by numerous countries and its Charter clearly states its intentions with regard to the destruction of Israel. Neither of those issues – as this synopsis leads readers to believe – is exclusively the view of the Israeli prime minister. During the interview Ashrawi – with very little interference from Badawi – goes to great pains to try to convince audiences that the new ‘unity government’, the PLO and Hamas are all unconnected subjects. Unfortunately Badawi refrains from asking the crucial question of what will happen if elections take place as stated in six months’ time and this unelected “government of independent professionals” is replaced by one which includes Hamas. She does not ask exactly what such an unelected interim government will be “able to deliver” to the Palestinian people or what will happen if that “unity government” adopts policies at odds with those of the PLO. Neither does she press Ashrawi on the non-inclusive and non-democratic make-up of the PLO itself, with members of the Palestinian National Council – the PLO’s legislative body – being nominated by the PLO Executive Committee rather than by the ordinary Palestinian people. Likewise Badawi makes no attempt to unravel the obvious complications arising from the fact that Hamas – which won a significant proportion of the votes in the 2006 PLC elections – is not currently a member of the PLO. Instead, Badawi allows Ashrawi to distract audiences from the issue of Hamas’ terror designation with a smoke and mirrors tirade of defamation. Again, Badawi does not use the opportunity to ask what will happen if Hamas once again wins the next election. She concludes by providing Ashrawi with yet another opportunity to promote PA political propaganda. Even the BBC must be aware that when the PA demanded the inclusion of Israeli Arabs among the list of terrorists to be released it knew exactly how that demand would endanger the talks. Of course when Mahmoud Abbas signed applications to join various UN bodies in defiance of the ‘pre-nup’ agreement which facilitated the current round of negotiations, it was perfectly obvious that their continuation was in jeopardy. Likewise, the PA and the PLO were well aware in advance of the precise reactions that a ‘unity agreement’ with Hamas would bring from Israel and the international community. But Badawi makes no attempt to clarify those points to BBC audiences and instead allows them to go away with only Ashrawi’s unchallenged PLO propaganda. Once again the BBC makes a mockery of its commitment to “enable individuals to participate in the global debate on significant international issues”. Precisely what does the BBC mean when it uses the word ‘occupation’? We do not have to suppose or speculate about the answer to that question because the BBC’s Key Terms guide tells us exactly what it means. The phrase ‘Occupied Territories’ refers to East Jerusalem, the West Bank and strictly speaking the Golan Heights. However, it is common usage for this phrase to refer to the West Bank as a whole and not the Golan Heights (unless it is in a story specifically on the 1967 War or Syrian/Israeli relations). In other words, when it uses the word ‘occupation’, the BBC intends readers to understand that it is describing areas which came under Israeli control as a result of the Six Day War. 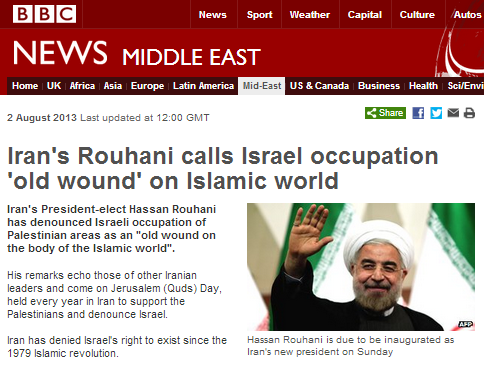 So consider this August 2nd BBC headline: “Iran’s Rouhani calls Israel occupation ‘old wound’ on Islamic world“. As others have noted, Rouhani of course made no such distinction between areas east or west of the ‘green line’: his ‘problem’ is with Israel as a whole – not just this or that particular part of it. The article’s strap-line further shows the BBC’s transparent attempt to tone down Rouhani’s rhetoric by insertion of the phrase “Palestinian areas”. What does the BBC mean when it says “Palestinian areas”? We do not have to guess about that one either. This phrase has become more widely used by politicians and broadcasters to refer to the Occupied Territories – for example, to explain why the construction of settlements is considered illegal by the UN. Critics of the phrase say it is not strictly accurate because, for example, the West Bank was captured from Jordan in 1967. The BBC Governors considered this issue in a complaint which was referred to in the programme complaints bulletin of July 2004. Their decision was that, although the complainant objected to references to ‘Palestinian land’ and ‘Arab land’, these terms “appropriately reflected the language of UN resolutions”. So the use of the phrase “Palestinian areas” is clearly intended to reinforce the false impression that Rouhani was referring to land gained by Israel in the 1967 war. Why the BBC should find it necessary to tone down Rouhani’s remarks in a manner which it presumably thinks makes them more palatable to Western audiences is anybody’s guess, especially as other members of the Western media managed to report the geographical intentions of Rouhani’s words accurately. Speaking at a rally, Mr Rouhani said: “There is an old wound on the body of the Islamic world, under the shadow of the occupation of the holy lands of Palestine and Quds [Jerusalem]. But the BBC’s whitewashing does not stop there. That’s “Death to Israel”, dear BBC – not “Death to the bits of Israel east of the ‘green line’ “. “The day before he took office, Mr Rouhani said Israeli occupation was an “old wound on the body of the Islamic world”, as Iran marked its annual Jerusalem (Quds) Day. It appears that the BBC is having difficulty sobering up after its ‘Rouhani the moderate reformer’ binge following the June elections and that, rather than engaging in a critical review of its own misguided stance, is now attempting – fingers placed firmly in ears – to bend reality to fit its own narrative. That policy of course does nothing to meet the corporation’s obligation to enable its audiences to “build a global understanding of international issues”. Of course Rouhani had no need to mention Israel by name: his audience at what Zeinab Badawi ridiculously insists upon calling the “pro-Palestinian rally” would have understood his intention perfectly well, given the Iranian regime’s record and its long-standing support for terrorist organisations which do not accept Israel’s existence in any form. BBC audiences, however, will remain in the dark due to this latest bout of the syndrome described by Sohrab Ahmari and James Kirchick in 2012 as “We Are All Persian Grammarians Now“. Clearly, the BBC could have avoided this case of inaccurate and misleading reporting had it simply been more vigilant in its use of quotation marks in that headline. This episode of the BBC programme ‘Hardtalk‘ in which Zeinab Badawi interviews Coptic Christian Naguib Sawiris – founder of the Free Egyptians Party – is not connected to Israel, but it is both interesting in itself as well as useful in that it provides a glimpse into BBC perceptions of the “Arab Spring” some six months after the publication of the BBC Trust commissioned report on the subject. 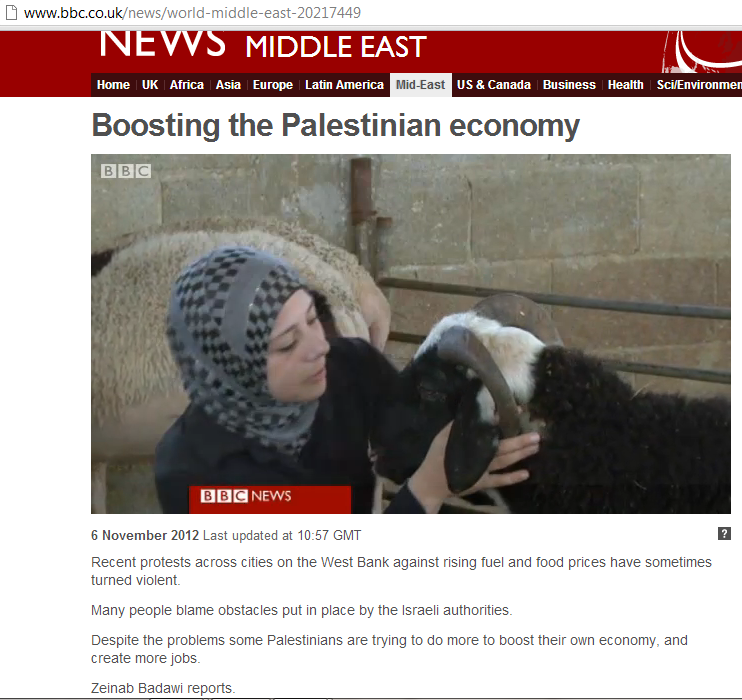 One day, perhaps, a BBC journalist will make a fact-based programme which will explain to audiences the real reasons that lie behind the weakness of the economy in the Palestinian National Authority controlled areas. Such a report would of course have to include factors such as the population growth rate, the rise of the dependency of the PA economy upon foreign donations from 10.47% in the year 2000 to over 60% in recent years, the endemic corruption, the lack of investment in infrastructure and means of production, the top-heavy civil service sector, the payment of wages to workers in Gaza who stay at home and convicted terrorists in Israeli jails, the inefficient tax collection, the self-inflicted effects of the second Intifada and the stifling influence on the economy of foreign NGOs and aid agencies – as well as many more contributing elements. But until that day, BBC audiences will have to make do with superficial reports such as the one broadcast on BBC News by Zeinab Badawi on November 6th 2012. 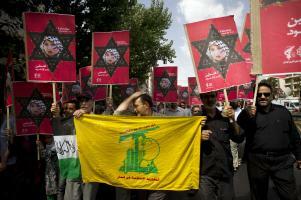 “Recent protests across cities on the West Bank against rising fuel and food prices have sometimes turned violent. Many people blame obstacles put in place by the Israeli authorities. Seeing as the territory controlled by the PA (both at present and under any future agreements) is landlocked, the situation regarding sea ports is not going to change unless the PA resolves its differences with Hamas and constructs a port in the Gaza Strip. That, of course, has nothing to do with Israel. As for the border crossings into Jordan, the 1994 Paris Economic Agreement – which some called to annul during the September demonstrations against the economic situation in the PA – includes provisions for PA customs control there. The Palestinian Authority will have full responsibility and powers in the Palestinian customs points (freight-area) for the implementation of the agreed upon customs and importation policy as specified in this protocol, including the inspection and the collection of taxes and other charges, when due. Israeli customs officials will be present and will receive from the Palestinian customs officials a copy of the necessary relevant documents related to the specific shipment and will be entitled to ask for inspection in their presence of both goods and tax collection. The Palestinian customs officials will be responsible for the handling of the customs procedure including the inspection and collection of due taxes. Unfortunately, of course, the decision by the Palestinian Authority to launch a terror war against Israel in 2000 has had repercussions on all aspects of the Oslo Accords of which that protocol is part. Badawi also interviews an olive farmer who states that “After the 1967 war so many young people left because of the lack of job opportunities”. A somewhat less one-dimensional view of the situation at the time can be read here. Significantly, she neglects entirely to mention the fact that – as in the past – the Israeli government has in recent months done much to try to boost the ailing PA economy, including making advance payments of 380 million shekels of tax monies not yet collected and adding a further 5,000 new work permits. Badawi also fails to mention the 617 million shekel debt owed by the PA to the Israel Electric Corporation, the PA’s $1.1 billion deficit in 2011, Israel’s appeals to the International Monetary Fund for aid to the PA and so forth. By resorting to the all too easy and simplistic default option of blaming Israel for just about any Palestinian problem, Zeinab Badawi displays a blatant disregard for accuracy. It is therefore not surprising that on occasions such as this, the BBC’s impartiality is then called into question. “HARDtalk is the hard-hitting flagship news programme shown on BBC World News and the BBC News channel. The half hour interview is the result of detailed research and in-depth investigations. Notably, presenter Zeinab Badawi allows Hamad to speak about the blockade without bringing up the subject of rocket fire at Israeli civilian communities. When forced by the constraints of ‘impartiality’ to represent the Israeli point of view as Hamad recites his list of Israeli ‘crimes’, Badawi displays palpable ennui which, when interrupted by Hamad fizzles out into an apologetic “I was just trying to give you what they…”. Badawi asks Hamad about arms smuggling through Rafah, but when he changes the subject to that of the smuggling of food, medicines and building materials, she fails to follow through. Her final attempt at ‘impartiality’ is a lame “they [Israel] deny that of course” after Hamad states “We are sure that Israel poisoned President Arafat”. This is not the first time that Ghazi Hamad has appeared on ‘Hardtalk’. Here he is in May 2011 going completely unchallenged by presenter Stephen Sackur when he says that Hamas is ready to “liberate our homeland” and claims that Hamas is not a terrorist organization, not radical and not extremist.